It’s only June and it’s been in the 100’s already. With our house up for sale and multiple showings a day it get’s exhausting to have the kids keep the house clean all the time. Okay, it’s impossible. Cooling off in the backyard at night with a cool drink while lounging on the patio furniture and typing on my computer is my favorite way to unwind. The other night we sat together as a family, drank some of these and cooled down in the shade. It was the perfect ending to a chaotic day of showings! 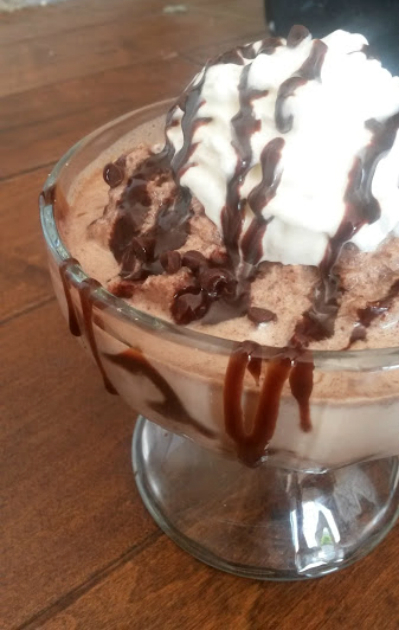 This recipe resembles the famous Serendipity Frozen Hot Chocolate but with one amazingly good ingredient….peanut butter. Peanut butter lovers unite, this is the summer drink for you! If you love the recipes above, don’t forget to scroll down and see what other recipes are being featured this month. In a small bowl, stir together the chocolate chips and unsweetened chocolate. Place the bowl in the microwave and cook at 30 second intervals until chocolate is melted. Stir after each cook cycle until chocolate is melted and smooth. Once chocolate is melted, stir in the sugar and 1/2 cup milk, stirring continuously until smooth. Set mixture aside and allow to cool. Once mixture is cool, pour it into a blender along with the remaining milk, half and half, peanut butter and ice. Blend until smooth. Divide the mixture between four glasses.Top with whipped cream, peanut butter chips, and mini chocolate chips. Drizzle with chocolate sauce. Frozen anything is more than welcome right now… hot hot hot, the way I like it! Anything peanut butter and chocolate sounds great to me! Serve me up one right now! Three cheers for peanut butter and chocolate. Happy Reveal Day! Liquid chocolate and peanut butter. You must have felt like Heaven came right down into your back yard. Two frozen hot chocolates in one reveal day!? I think the SRC gods are telling me it’s about time I try this treat! I am definitely a chox and pb fan. Great choice! So glad you enjoyed it! Thanks for all the kind words! 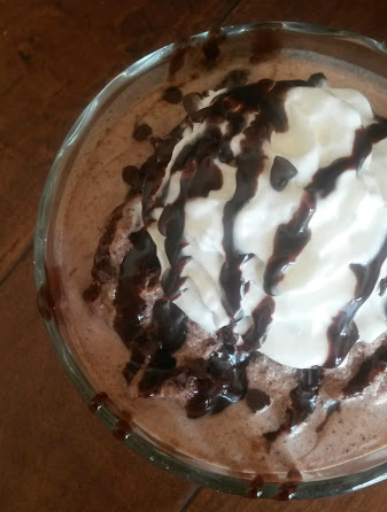 We were thinking along the same lines this month (staying cool) I made frozen Nutella hot chocolate! Happy (late) reveal day! My goodness – chocolate and peanut butter – that sounds like a little bit of heaven on a hot day. Good luck with selling your house! Hopefully it sells soon do you can enjoy summer! Yum, love frozen hot chocolate! Great pick this month. Good luck with your house!